A new year means you will most likely be freshening up some room designs in your home. I know I will be, I have many rooms to tackle and refresh this year. 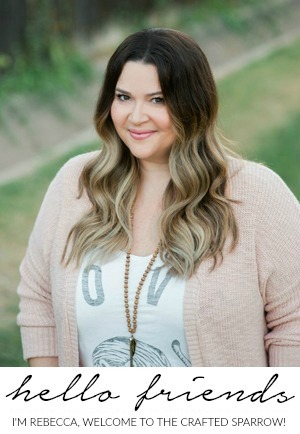 When I do refresh a room design I love bringing in new custom accessories to make a space fresh and new, and it doesn’t hurt if it’s budget friendly right? 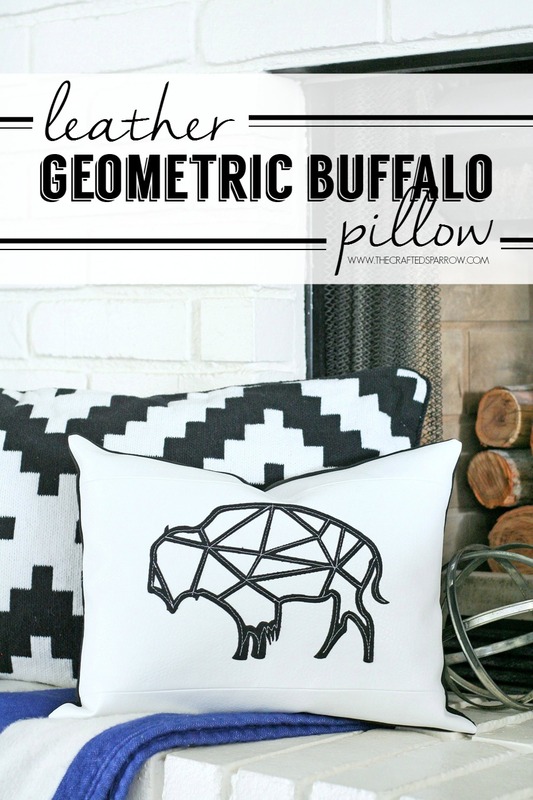 Today I’m sharing my latest home decor project, this Leather Geometric Buffalo Pillow is going to be the perfect addition in my master bedroom design this year. 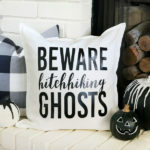 With the help of the new Bits and Pieces Cricut® cartridge and my trusty crafting tool the Cricut Explore I was able to create this custom home decor piece using items I already had on hand. 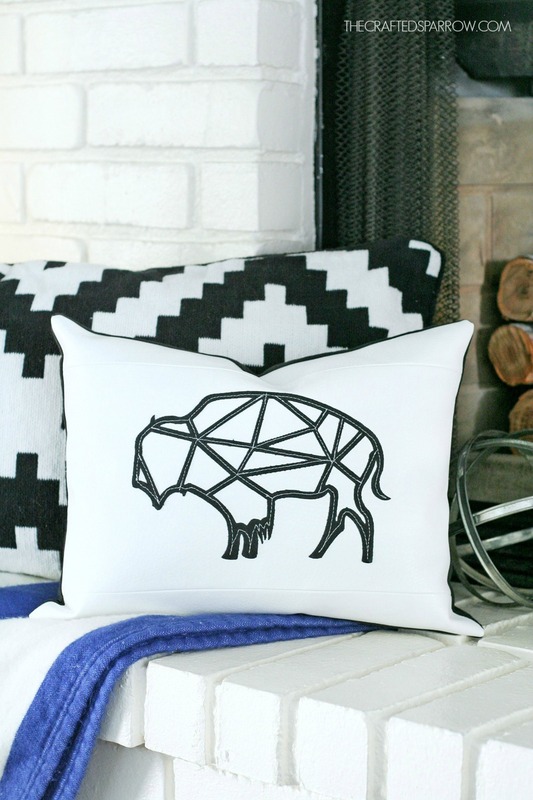 I do love the trend of deer and antlers in home design, but I wanted a fresh take and the geometric buffalo design fit my style a little better. 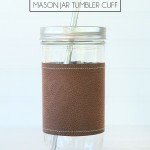 Want to make this project? 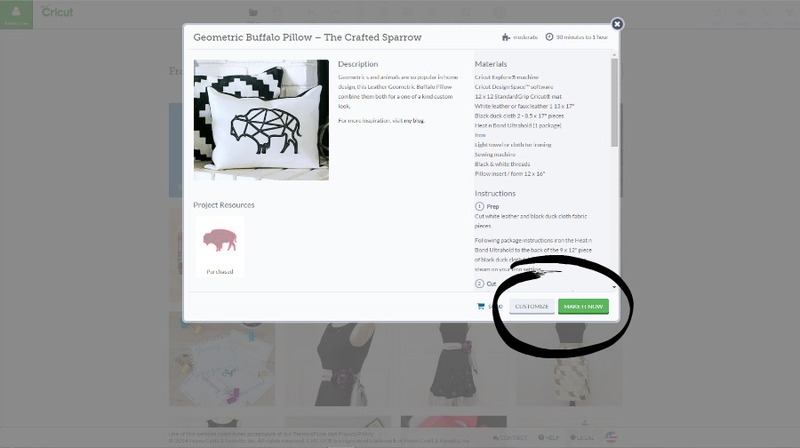 Go HERE and hit Make It Now to cut the geometric buffalo for your pillow. Be sure to choose “Customize” if you need to change the size of the image at all, or fabric type. White leather or faux leather, 1- 13 x 17″ piece. Black duck cloth, 2 – 8.5 x 17″ pieces & 1 – 9 x 12″ piece. 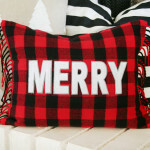 Following package instructions iron the Heat n Bond Ultrahold to the back of the 9 x 12″ piece of black duck cloth fabric. Be sure to have no steam on your iron setting. In Cricut Design Space™ cut the geometric buffalo design, place the fabric on the mat so that the Heat n Bond side is down. Turn the dial to the Custom setting, select Canvas – 0.75mm and hit GO. 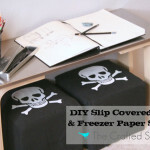 Once the design is cut remove it from the cutting mat and remove any negative fabric scraps. It will peel away from the paper backing leaving the shiny side of the Heat n Bond on the fabric. 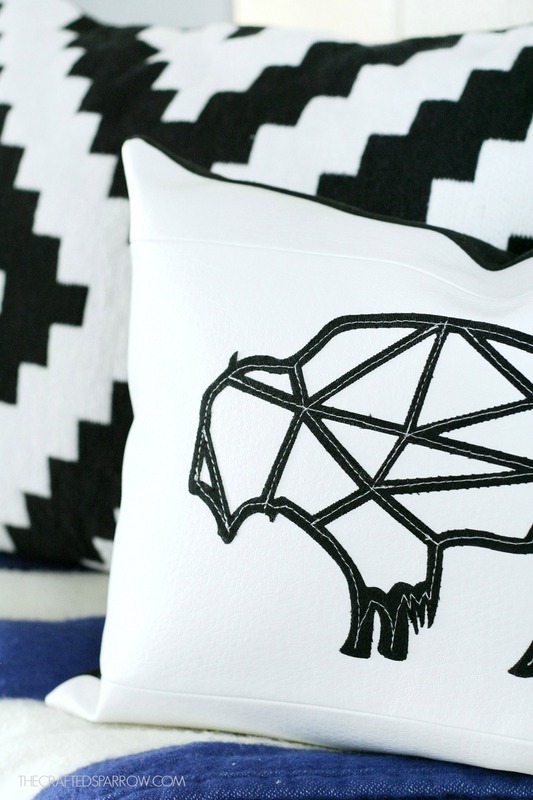 Take the 13 x 17″ piece of white leather or faux leather and center your geometric buffalo image on the front side. Place a light towel or cloth over the entire piece of leather or faux leather and your centered image, being careful to not move it. Using an iron with a no steam setting press firmly over the geometric buffalo design for several seconds at a time. Wait a moment for the design to cool, be sure the image has adhered to the leather or faux leather surface. If it hasn’t repeat the previous step until it has. Using your sewing machine stitch over the design of the geometric buffalo with contrasting white thread. You can also use black if you prefer. 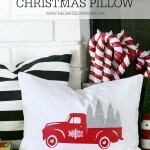 This will insure the design stays in place on your pillow since the heat n bond isn’t meant for leather fabrics. 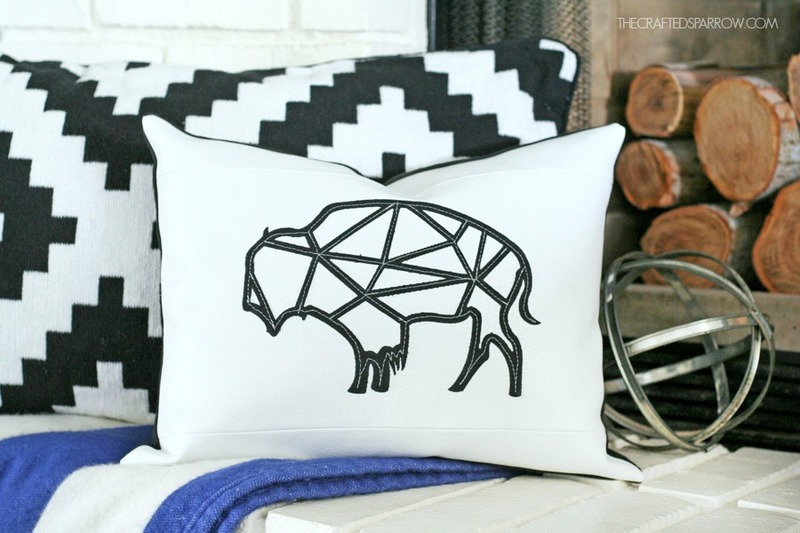 Following this easy tutorial HERE, sew your entire pillow cover, using the 2 – 8.5 x 17″ pieces of black duck cloth and the white leather or faux leather that has your geometric buffalo image. Isn’t it fun? I hope you love it as much as I do. Disclosure | I received compensation in return for my work. All ideas and opinions are 100% my own. Thanks Lindi. I’m so glad you love it. Just to clarify for this project I didn’t cut leather, I did cut the duck cloth buffalo with the Cricut though. Although I have cut leather / faux leather several times and the machine works amazing for it. You can see that project here: http://www.thecraftedsparrow.com/2014/08/diy-geek-chic-leather-tablet-sleeve.html I just love this machine and all it can do, have fun! I just LOVE this project. Love love love it. Seriously in love with this. Of course I click over from the party and this is yours 🙂 I love it! Ha Ha! 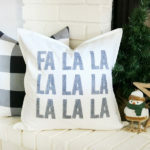 This pillow totally reminds me of you when I made it. I love that we both black & white decor so much! 😉 Thanks girl. this is pretty incredible. I kind of want to try this with other animals. Thanks so much Havalah! That would be so fun! Have a super week. This is actually a bison design. 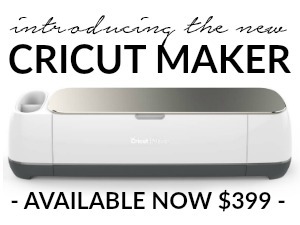 Hi Izzi, it is actually a buffalo – at least that’s what Cricut has named it in their digital images library. Have a super day!